Probiotics boast of improving your overall health. But what’s the best way to gain their benefits—and are they safe during pregnancy? If your goal is to maintain a healthy digestion and enough “good” bacteria and other microbes in your intestinal tract (intestinal microbiome) prebiotics and probiotics can help with that. Your intestinal microbiome is a control center for your body’s immune system, brain function and metabolism. So it seems smart that you might want to take steps to keep the trillions of microbes in your microbiome in good shape. Prebiotics are non-digestible ingredients in food that promote healthy microbes in your intestines. Probiotics are living microbes (including many bacteria and yeasts) that provide health benefits to our bodies. Research has shown that probiotics are helpful in treating diarrhea and bacterial vaginosis (a common vaginal infection). They also support the microbes in your intestines when you take antibiotics, which can kill off good microbes. This is why it’s important to take probiotics with an antibiotic, which can upset your digestion and the bacterial balance in your reproductive tract. There’s also evidence that probiotics can stabilize blood sugar. If you’re at risk of developing gestational diabetes during pregnancy, or have already been diagnosed with it, eat more high-fiber foods rich in prebiotics and probiotics. In one study, women with gestational diabetes improved their fasting blood sugars and slowed their pregnancy weight gain by taking probiotics for 6 weeks. As far as taking pre- or probiotic supplements, since the FDA doesn’t evaluate the effectiveness of supplements, or their safety, be aware of this limitation. It may be safest to get your pre- and probiotics through your diet versus supplements during pregnancy. Begin with enough fiber in your diet to improve your digestion. 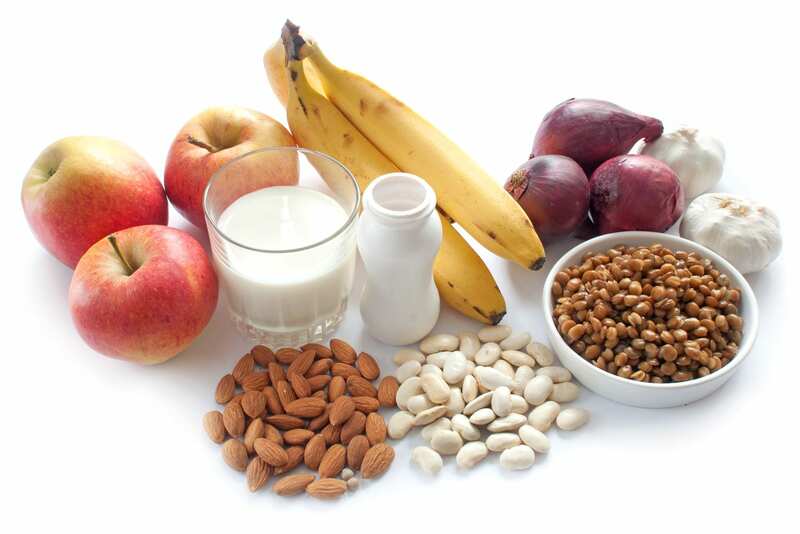 Fiber helps the prebiotics or probiotics you ingest work better. Prebiotics are found in foods such as raw onions, leeks, garlic and Jerusalem artichokes. Probiotics are in fermented foods such as yogurt with live active cultures, kefir, miso, kimchi, kombucha, tempeh, sauerkraut and pickles. Variety is key: Your gut microbes feed off of prebiotics; fermented foods with probiotics replenish microbes in your intestines. Even when you’re not pregnant, it’s healthy best to clearly read ingredients and choose supplements from brands known to test for consistent potency and safety. Talk with your nurse about pre- and probiotics, especially if you’re considering pregnancy or are pregnant. To find out more about how probiotics can help your health click here.